Have you noticed that you’ve got some songs stuck in your head lately? Songs about snowmen and warm hugs and finishing each other’s sandwiches? What was that one about letting it go? Well, we’re not ready to let it go. 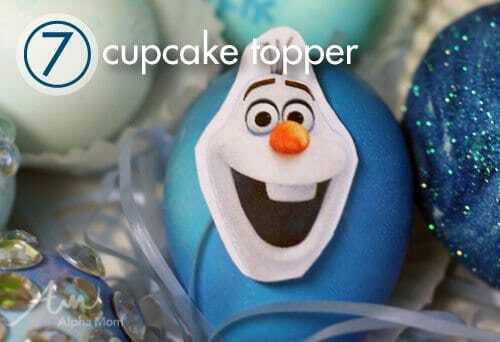 A trend is not officially dead until we design a craft inspired by it and have we got a Frozen movie craft for you! Not just one craft idea but TEN! That’s right. 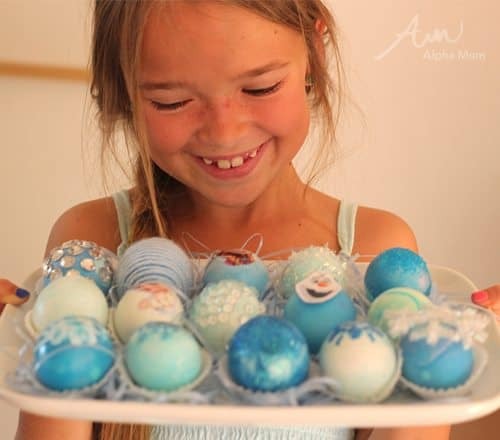 Ten Frozen-movie-themed Easter Egg decorating ideas because we know that’s what the songstresses and songsters in your house are wanting in their Easter basket this year. 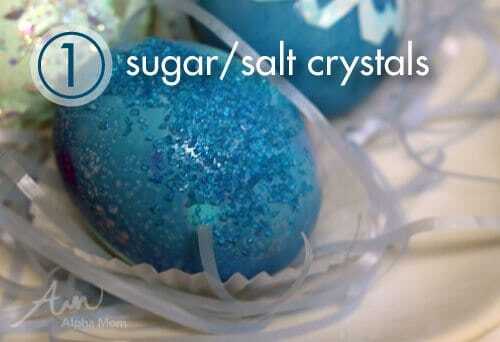 Idea #1: Try sprinkling some sugar or salt crystals on your eggs right after you lift them out of their blue dye baths. Some crystals will stick. Some will repel the dye, leaving interesting snow-like designs. 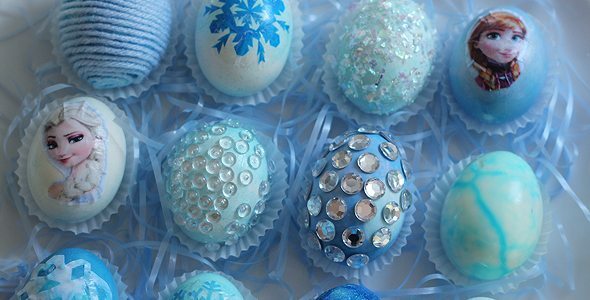 If your crystals aren’t sticking, try painting the egg first with white glue (if you’re not eating the eggs) or simple sugar syrup (if you are eating the eggs). It’s not likely that the glue will penetrate the egg shell but let’s just stick to edible ingredients if you do plan to peel your eggs and make egg salad out of them later. Idea #2 Temporary tattoos aren’t just for skin anymore. 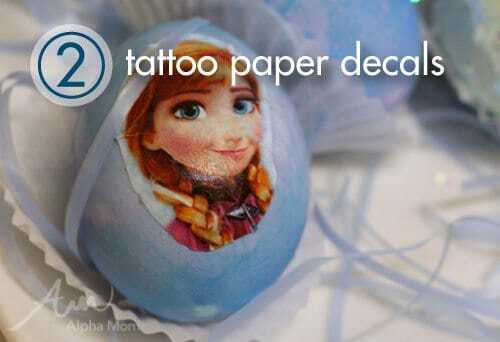 Print out some cupcake toppers on temporary tattoo paper and apply them to the eggs the same way you do to your arm. This method takes a bit of patience and doesn’t always take on the first try but give it some time and patience and you’ll love the result. If they don’t work, try stickers. They work 100% of the time. 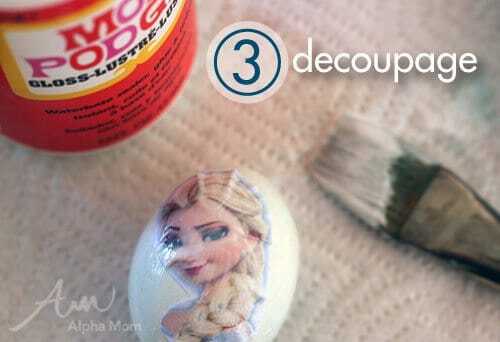 Idea #3: Here’s another way to apply cupcake toppers to your Frozen easter eggs… decoupage! Paint the backside of your paper with glue, place and then paint over the top generously with more glue. Press out the creases carefully with your fingers. 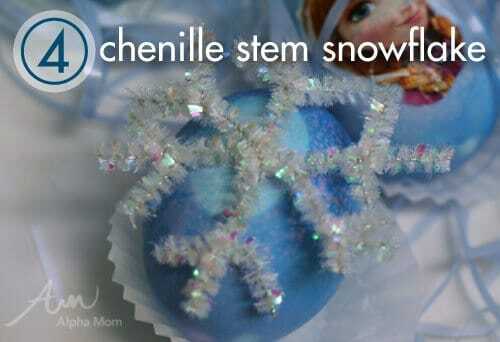 Idea #4: Remember those chenille stem snowflakes you made as ornaments for Christmas? Glue one of these to an egg with a dab of glue or sugar syrup and you’re sure to put a sparkle in any snow princess’s eye. Idea #5: Yarn-bombing isn’t just for lamp posts and parking meters, it’s a great way to cover any craft. 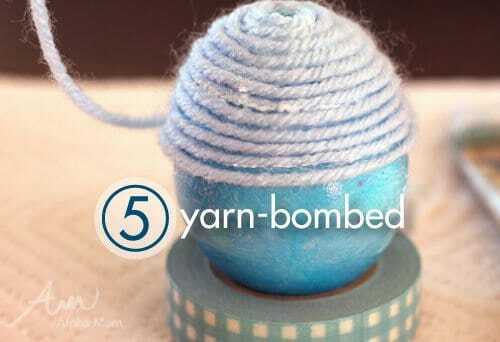 Paint your Easter egg with glue and then gently wrap your egg with light blue yarn. If you’re feeling really knitty, why not try knitting your egg a cozy! Idea #6: Here’s your chance to show off your snowflake-cutting skills. 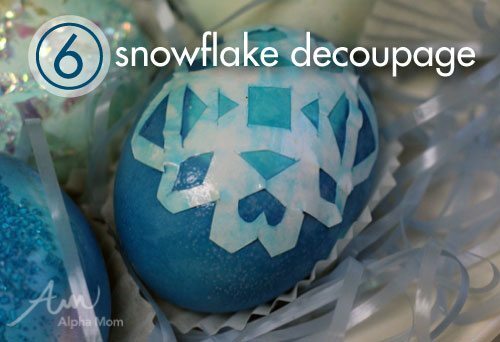 Get out the super-sharp* scissors and snip away until you have a tiny snowflake, then paste it to your egg with a generous layer of white glue. This one turned out so pretty, I wanted to make a whole basket of them! Idea #7: Who says everything has to be painted down? Try printing out some cupcake toppers and just affixing them with a simple tape loop. They look just as cute and take a fraction of the effort. Idea #8: Now’s the time to let go of your glitter phobia. Just let it go, let it go! The cold never bothered me anyway! (Ahem, where was I?) 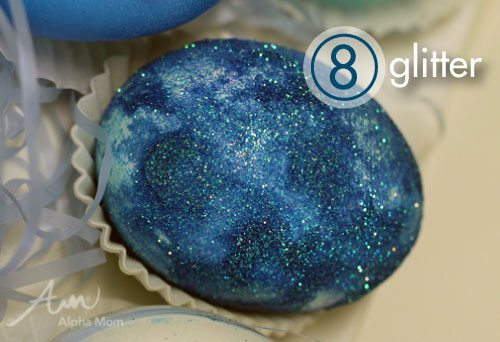 Paint your egg with glue or sugar syrup and then sprinkle all over with blue glitter. So pretty! 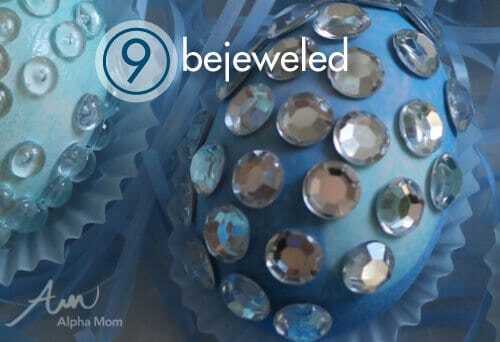 Idea #9: Bedazzle! You can buy tiny little gems at your local craft store and then stick them to your eggs to your heart’s content. So easy and yet soooo glamourous, who knew?! 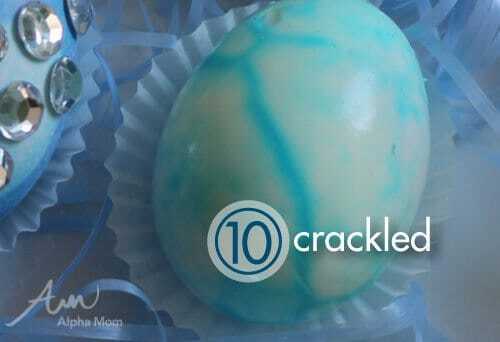 Idea #10: Crackled. This idea has been around the internet for a while now but it’s certainly appropriate for a Frozen-theme since the cracks look like cracking ice. It’s super easy too: just gently hit your hard-boiled egg on a counter top until it has dozens of cracks all over it. Soak in your blue dye, peel and ta-dah instant fractals! 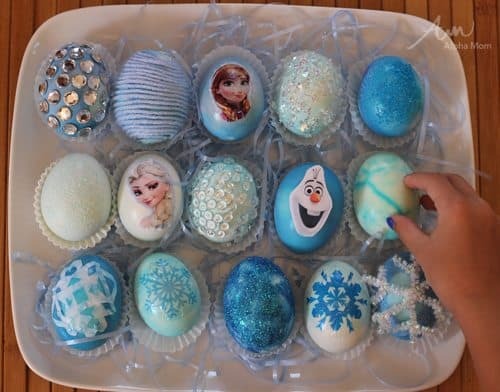 We hope you have enjoyed these Frozen-movie-themed Easter egg decorations and as you can see there are plenty more where these came from. You’ll probably invent ten more while you’re working on these ideas. Appropriate Age levels: seven and up. The tattoo decals can be a little intense, best for adults who can check their perfectionism at the door. ** When painting (with glue or paint) always paint in a well-ventilated area. Love it! My six yr old niece saw the pictures and squealed. We will be making these! I’m all over the sugar/salt crystals and bejeweled. So cute. LOVE IT! My daughter, much to my husband and my chagrin, absolutely loves Frozen and everything Queen Elsa and Princess Anna. We have only just started to embrace it (and serious discussed buying stock *smile*). We will be doing these eggs without a doubt! Thank you for all of your lovely ideas! You are so creative! Lovely eggs!